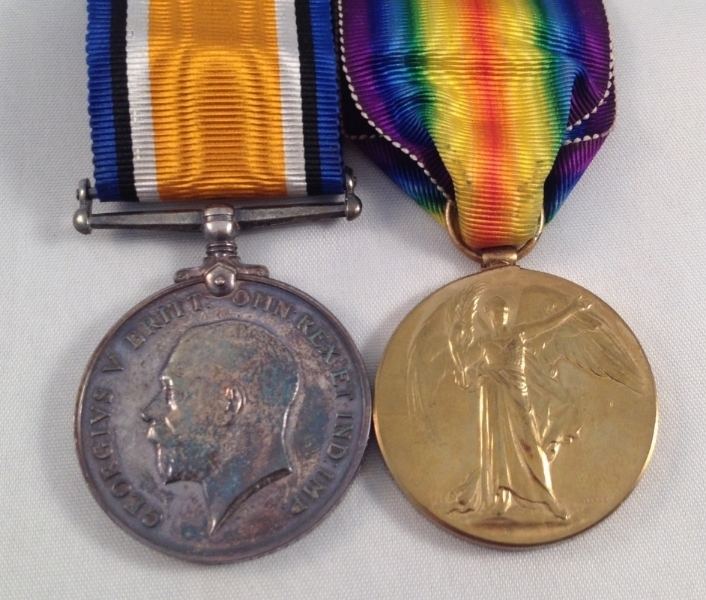 Private Harry Charles Allen was entitled to two medals; the British Victory Medal and the British War Medal. Harry Charles Allen was born in Hadleigh in 1900. 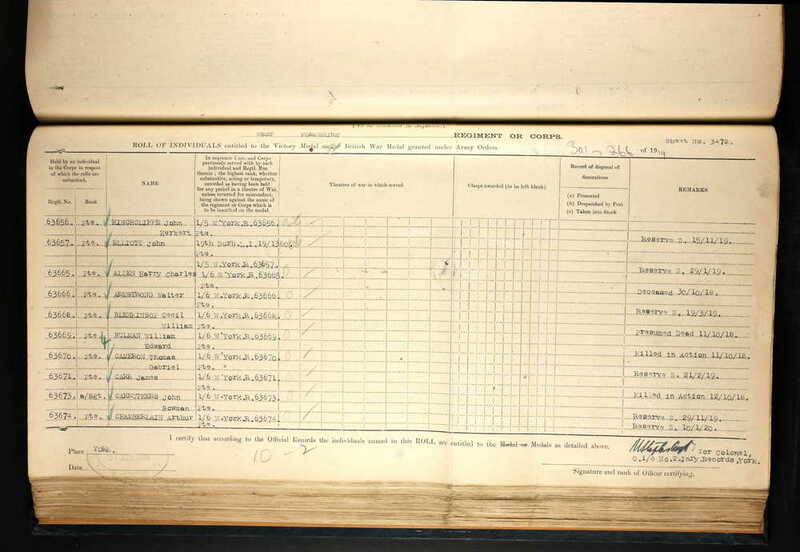 By the time of the 1911 census Harry was living with his Mother and Father, Louie and Henry Allen and brothers and sisters at 23 New Cut Hadleigh. 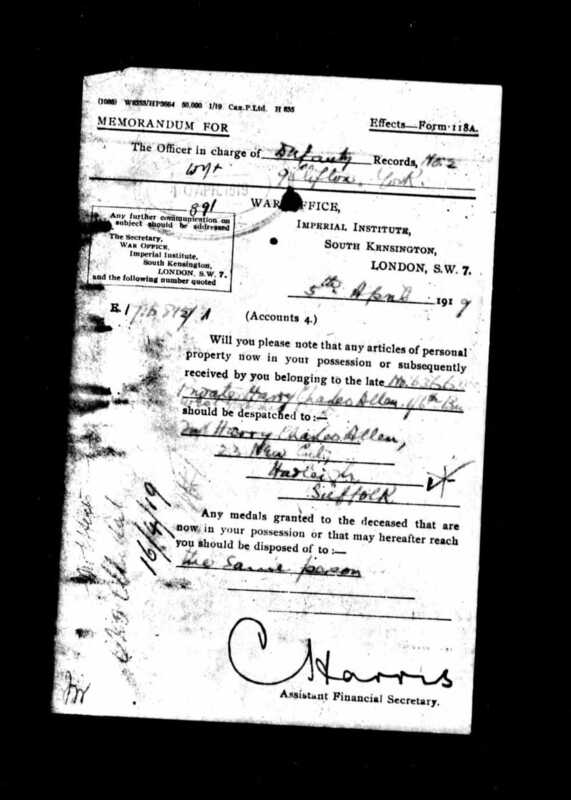 At the age of 18 years and 2 months Harry enlisted into the Army at Ipswich. He then joined a 'Training Reserve Regiment'. A considerable reorganisation of the reserve infantry battalions took place on 1 September 1916. Before this date, most of the infantry regiments contained one or more reserve battalions of the regular and new armies. Recruits would be posted to these battalions for basic training, before they were posted to an active service unit. With the introduction of conscription, the regimental system simply could not cope with numbers. A new structure was put into place: the Training Reserve. The local nature of recruitment for infantry regiments was abandoned and the entire system centralised. After 1 September 1916, regimental distinctions disappeared and the reserve units of the regiments were instead redesignated as battalions of the Training Reserve. They were organised into new brigades. No Guards, Irish or Territorial battalions converted to the TR. The reorganisation did not affect affect the Special Reserve or Extra Reserve battalions of the regular army (normally the 3rd and sometimes 4th Battalions of a regiment). The official complement of the Training Reserve was a little over 208,500 soldiers. 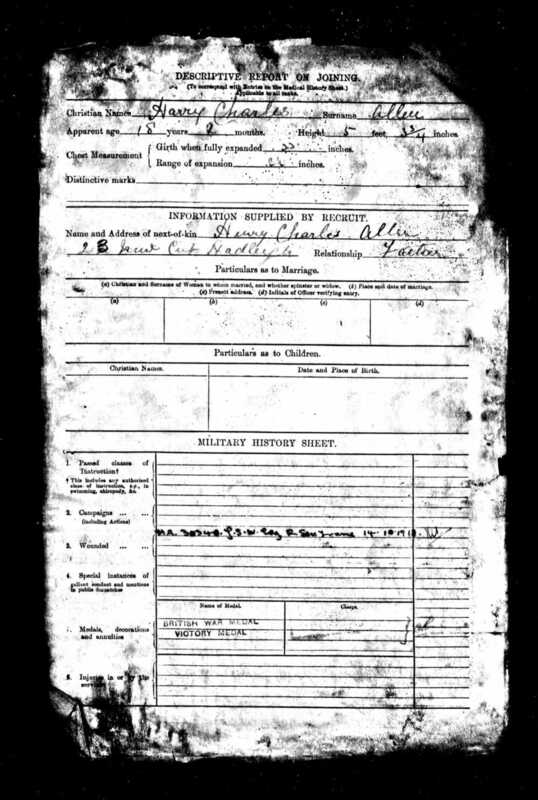 Men who were posted to the TR battalions were not allocated to any particular regiment when the time came for them to be posted. So from this time on it is not safe to assume that a recruit would serve with his local regiment. Later, from May 1917, this arrangement was itself altered when the units of the TR became Graduated and Young Soldier Battalions and were once again aligned with specific regiments. 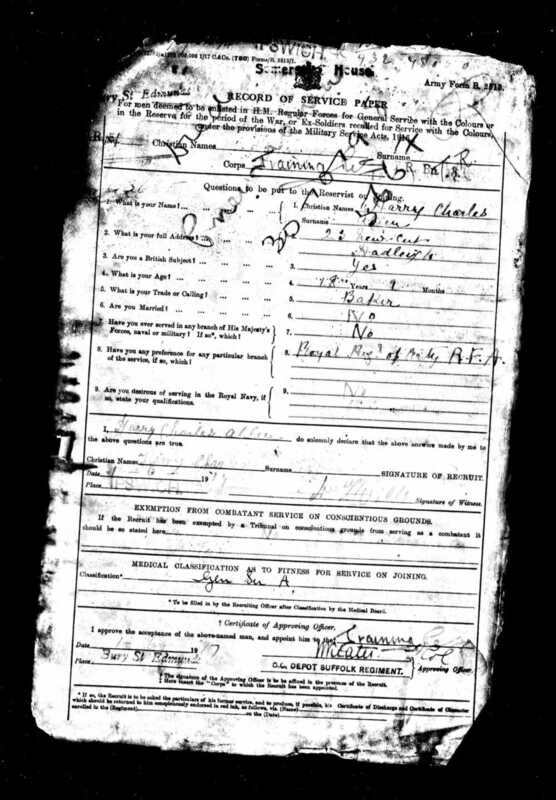 Harry completed his training and joined the 1/6th West Yorks Regiment in France on the 18 May 1918. The 1/6th West Yorks were part of the 146 Bde of the 49th (West Riding) Division. By October 1918 the allies were making significant advances and were pursuing the Germans who were falling back to a series of prepared defensive lines. The 49th Div were involved in 'the pursuit to Selle' from 9-12 October 1918. Although at the is stage the Germans were falling back, they had not given in and they continued to attack the advancing allies. 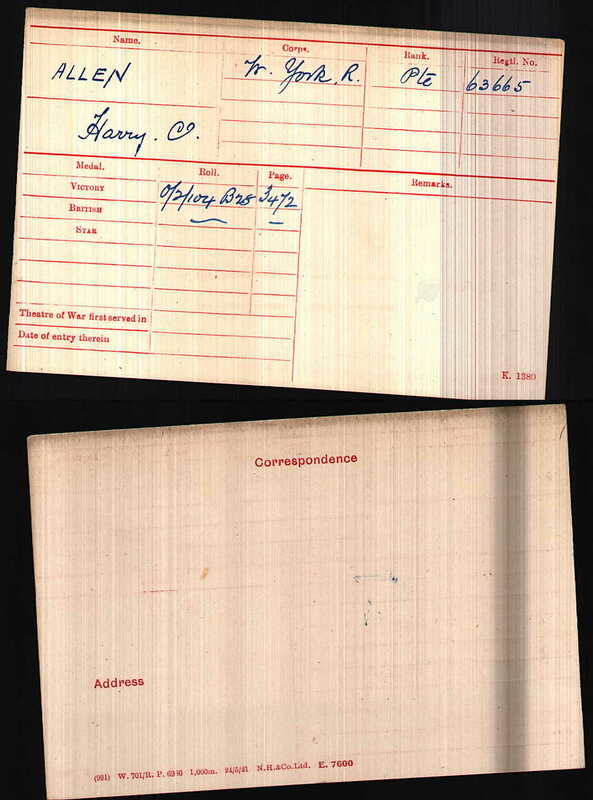 On 12 October 1918, Harry received a gun shot wound to the right thigh and was evacuated from the battlefield. 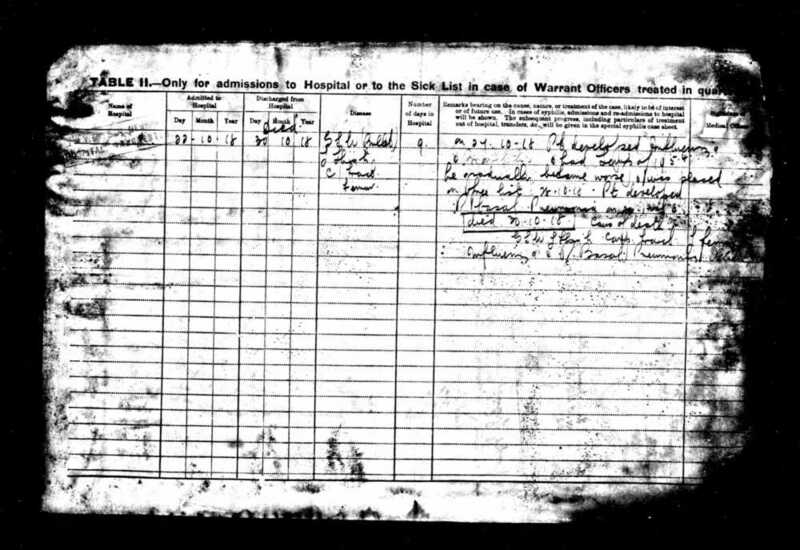 After passing through a series of medical facilities, he was transferred to England on the 19 October 1918. He was treated at Seymour Park Military Hospital (Old Trafford), Manchester. Although being treated for the gun shot wound, he developed Broncho Pneumonia and sadly died on 30 October 1918 (less than two weeks from the armistice). 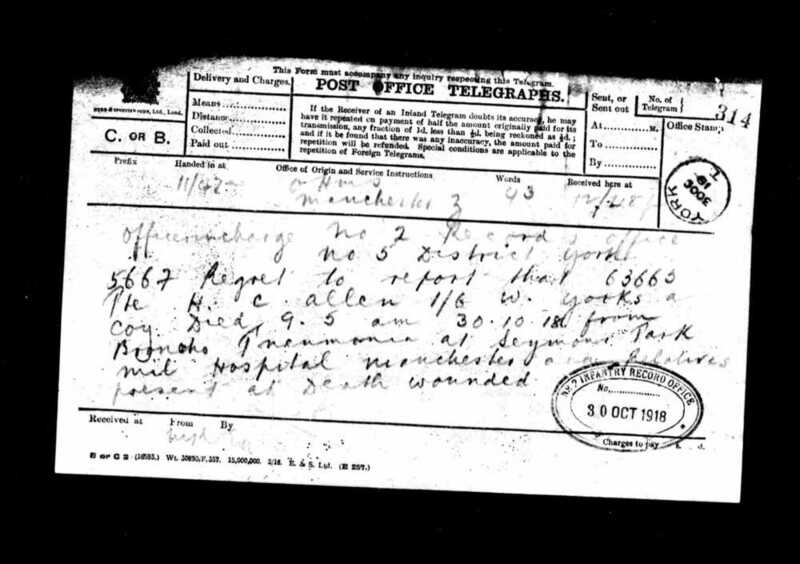 A telegram reporting his death suggests that relatives were present when Harry died. During the First World War, there were between thirty and forty war hospitals in Manchester and the surrounding area treating the wounded. These hospitals included; the 2nd Western General Hospital and the Nell Lane Military Hospital for prisoners of war. Those unfortunate casualties who died whilst at these hospitals were buried in nearby churchyards and cemeteries all across the Manchester area. When their individual graves could no longer be maintained it was decided to erect a permanent memorial at Manchester Southern Cemetery. Manchester Southern Cemetery commemorates 803 First World War casualties. Some are buried there, but most are remembered in name only on the memorial wall. These names include Private Harry Charles Allen. Harry was entitled to the British War and Victory medals and his family would have received a brass Memorial Plaque. The where a bouts of these items is currently unknown. Although Harry was single when he died, he did have a two sisters and two brothers and so it is hoped that there may be descendants still living in the Hadleigh area. Harry's living relatives at the time of his death. 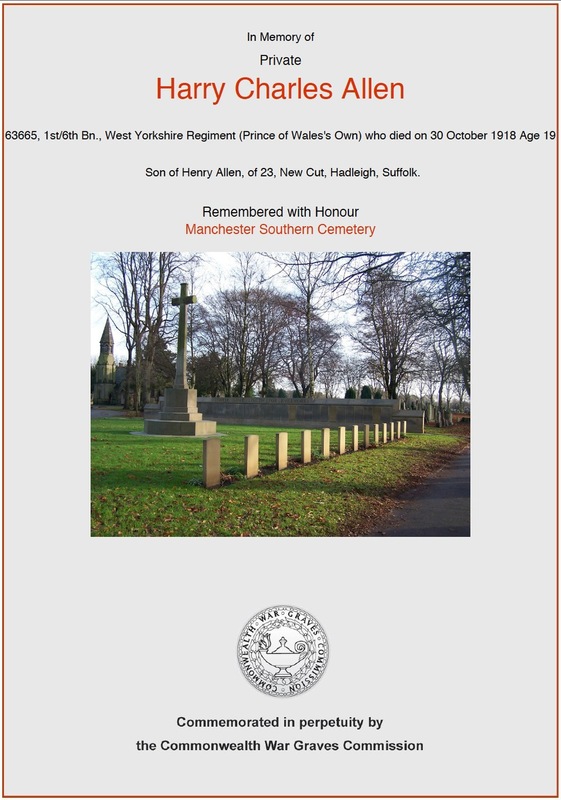 We hope that this page has been able to tell the story of Harry Charles Allen. If you know of any information which might help to add to the story then please get in touch.